Vitavet SuperDog Health & Vitality tablets have been scientifically developed to help safeguard your dog’s diet and to help maintain overall health, vitality and wellbeing in dogs of all sizes. SuperDog Health & Vitality tablets contain a unique combination of nutrients and bioactive elements. It is difficult to sometimes know the exact micronutrient content of what our dogs are eating. Pets eat highly processed food where the ingredients may be of questionable origin or are loaded with artificial colours that make the food look more nutritious than it really is. Some foods may have a lower than expected nutritional content. Therefore, pet owners need to make sure their dogs are receiving all the nutrients they need and so may wish to consider including specialist dog supplements into their pet's diet as a nutritional safeguard. Food supplements are not a substitute for a healthy balanced pet feed/diet. Generally, SuperDog Health & Vitality tablets may be used alongside medications. SuperDog Health & Vitality tablets contain only moderate levels of vitamins and minerals, and are free from any drugs or hormones. For specific advice on giving your dog SuperDog Health & Vitality tablets with medicines, we recommend that you contact your vet first. Owners of diabetic dogs should consult their vet before using this product. SuperDog Health & Vitality contains 30 delicious braised beef flavour chewable tablets. Not suitable for puppies under the age of 12 months. Small dogs: chew 1 tablet per day, medium dogs: chew 1 - 2 tablets per day, large dogs: chew 2 - 3 tablets per day. If required, break tablet(s) up and mix with food. SuperDog Health & Vitality tablets have no known side-effects when taken as directed. Do not let your dog exceed the recommended intake. In case of overdose, seek veterinary advice immediately. Owners of dogs with diabetes should consult their vet before using this product. 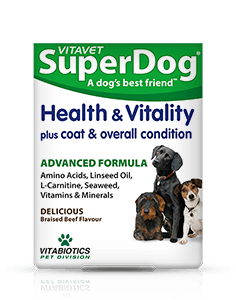 Results may vary amongst dogs as they do with humans, but in most cases, we would expect the beneficial effects of the nutrients in Vitavet SuperDog Health & Vitality tablets to build over one to three months. There is no maximum length of time over which SuperDog Health & Vitality tablets may be given. A regular intake is recommended.